This entry was posted on Wednesday, March 21st, 2012 at 8:10 am and is filed under Uncategorized. You can follow any responses to this entry through the RSS 2.0 feed. You can leave a response, or trackback from your own site. Just found out about Regeneration One. 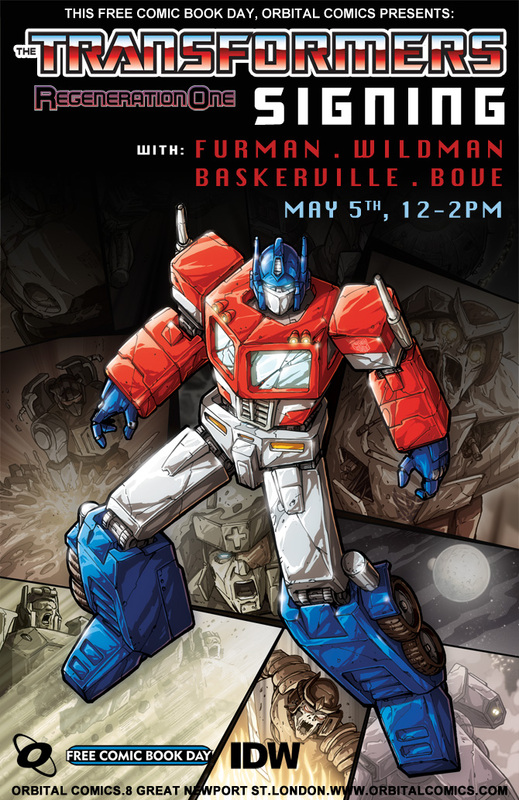 You ARE the Transformers Mr. Furman and Andrew Wildman was the first truly great Transformers artist. I never even imagined this series was a possibility. Stoked! I can’t wait for this to hit the store shelves. However, I was wondering if you are going to shed any light upon where Ratbat and Omega Supreme dissapeared to. The last time we saw of Omega he was in Ratches repair bay on the ark and the last time we saw Ratbat he was shot from behind by Scorponok. I was always dissapointed that after that they were never seen again. Granted, Omega was never used right in the G1 comics (of in the G1 cartoon for that matter) but Ratbat was a MAJOR player in the Marvel G1 universe and he just vanished. I can’t wait . Wish I was in London so that i could meet you guys (I have met you back in 1990 -Woodbridge New Jersey ) ,but never had the pleasure to meet the rest in person . But still very excited ,Free issue ,a series I have been waiting 21 years for . This is going to be a great year .